Aston Martin Cygnet: Aston Builds A Minicar? 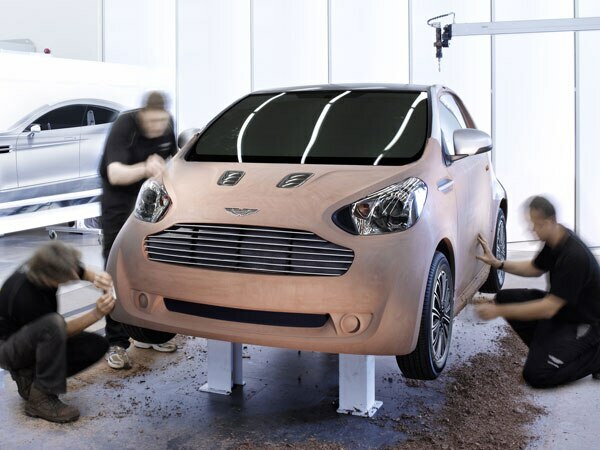 / News / Aston Martin Cygnet: Aston Builds A Minicar? If the clay model shown above looks anything like a Toyota iQ, there’s a good reason for it. Aston Martin’s latest concept, the Cygnet, is based heavily on Toyota’s smart fortwo fighter. Indeed, from this photograph of an early clay model, it seems much of the iQ’s design remains untouched. Aston designers are largely playing with the Toyota’s front fascia, adding the brand’s traditional grille, hood scoops, and an aggressive front fascia. Given its legacy and portfolio, we wouldn’t expect Aston to play in the microcar segment, but the firm believes the Cygnet could appeal to Aston buyers. Like a dinghy or tender on a yacht, a DB9 owner could use a Cygnet for urban commuting, while the sports car could be reserved for open roads and long trips. We imagine there’s a second reason behind the Cygnet: If placed in production, it would help improve Aston Martin’s overall emission and fuel economy averages.